unparalleled by any woman in these regions even to this day. conversion. 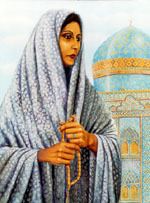 People claimed that Tahirih’s words cast a spell. home of Tehran’s chief of police, and in August 1852, secretly executed. stop the emancipation of women’. depicts the heights of mystical and spiritual experience.